I was talking to one of my clients this week and we were discussing the idea of giving, being of service, leaving a legacy and the visible and invisible rewards of giving. Since I retired from the military and became an entrepreneur, I made the decision to give 10% of my income to a foundation that is near and dear to my heart. There are so many great causes to be a part of however, in 2016 when I was at a personal development seminar in CA, we were participating in an exercise called, The World Game. The facilitator of the exercise would describe various living conditions for people in different parts of the world, show really emotional videos and photos dealing with hunger, abuse, trafficking, clean air and water. To further illustrate the point and create an impact they would move the 500 of us participants to different parts of the room so we could physically see the proportions of society impacted by these issues. When I could see how many people didn’t have access to clean water or air, I couldn’t contain my emotions…something that we take for granted every day, something so simple. I wanted to make a difference and made the decision to give to an organization I felt I could trust and that I felt in alignment with. Within 3 months, I met Cynthia Kersey from the Unstoppable Foundation and fell in love with their mission. Now, I always would give to different charities over the years, but not consistently and the amounts I would give were very sporadic and peanut butter spread over a few organizations. I firmly believe that any giving is good giving. Every minute, every dollar and every cent adds up and makes a difference however, I wanted to really go all in, take a deep dive and create massive impact for a community. I just started my coaching business and I decided how much money I would earn and how much a 10% allotment would be to go to the Unstoppable Foundation. This was scary because I had just started coaching, didn’t know where my clients would come from and didn’t have any projected income to support my giving. For two years I gave, not according to what my income was, but what I had decided my income would be; and for two years, my income ALWAYS followed and fell in line with what I willingly gave. Most people say, “If I get this much money, then I’ll contribute this much.” Well that’s faulty logic because that is an example of allowing circumstances to govern your decision making as opposed to you deciding on what you’ll create. I found myself recently falling into this faulty way of thinking. If I want to give in the way I described earlier and have a massive impact in the world, I’ll need to receive more income, right? Well for two years I felt capped at the same level of income and I was thinking of more effective ways to serve, then the realization smacked me in the face. If I want to earn more to give more, I need to give more first! We are dealing with Universal Laws and those laws are exact. We always attract what we are in harmony with. I was in harmony with my level of income and my level of giving. If I wanted to create something different, I had to be willing to do the illogical, and step out of my comfort zone. My goal has always been to 10 times my monthly donation but I wasn’t doing it; I was waiting for my income to support my giving. Universal Law doesn’t work that way. In January of this year, I doubled my contribution and I was scared because I didn’t have the income to support it. The next day, four people booked appointments with me for discovery sessions and all four became clients and I got hired for a speaking engagement. I gave, and then Universal Law came into play and I received the income that supported my giving. I did that again in February…The next day, four people on a group call chose to let me coach them…again, I gave and the income came to support my giving. In March I did the same thing and one of my dreams came true! I was told that I had funded one village in Kenya, providing education for girls, nutrition, clean water, medical care and their families with job training to sustain their own communities! I am traveling to Kenya this summer to meet these beautiful young women and see what they are creating. After I received this news, I tripled my giving in March and the month isn’t over yet. 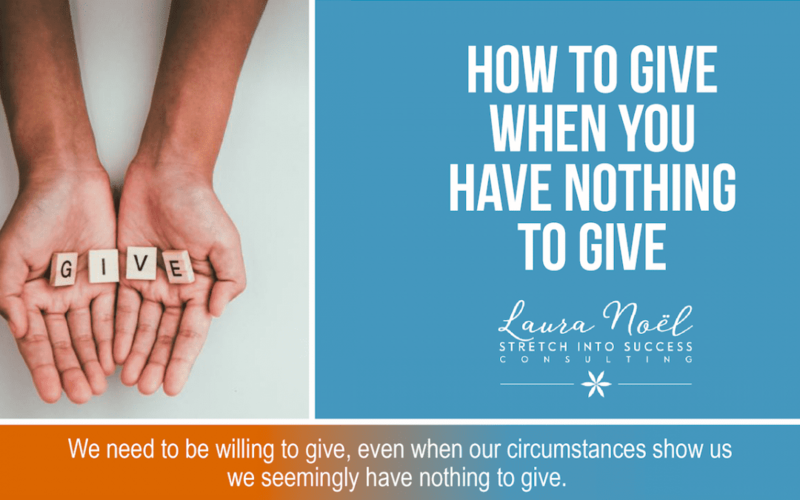 What I learned is we need to be willing to give, even when our circumstances show us we seemingly have nothing to give. When we allow our circumstances to influence our thinking, we get caught in the trap of faulty logic, lack, scarcity and fear. Those negative emotions attract more thoughts and circumstances that are in alignment with those thoughts. This is how we remain stuck. If you want to get unstuck and live in abundance, you have to live and give like you are abundant first. There are so many ways you can give. You can give your time and energy to help people in need. You can give prayer and really take the time to send positive energy to people. Maybe giving things that you are no longer using, to people who are in need. When you think about it, there really is so much we can give and when we give, that positive energy always comes back to its source in one way or another.